A friend sent me a link to a list of MSN City Guide's top cupcake bakeries in the United States. I was shocked to find that not a single Los Angeles bakery made the cut. A Portland bakery did, however. Fortunately, the friend who sent me the link is engaged to a friend who just happened to be traveling to Portland last weekend. What are the chances! Better yet, she brought back a box of these scrumptious cupcakes. The Portland bakery is Saint Cupcake and I have to admit, they're among the best I've ever had. Here's the box that made it safely from Portland to Los Angeles. 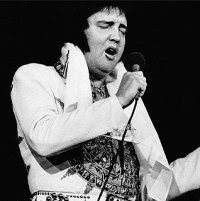 The cupcake in the upper left (and featured solo at the top of the post) is The Fat Elvis, a banana chocolate chip cake with chocolate peanut butter frosting and a fried banana chip at the peak. I do think L.A. got snubbed because there are some excellent cupcake bakeries here. To remedy that, I have a mission for you. A mission you should enjoy. Take advantage of a little anthology the LA Times put together. 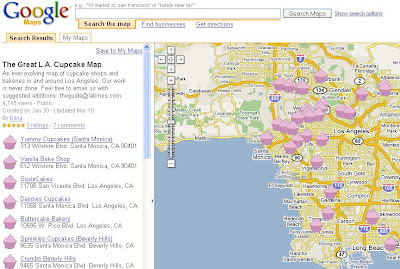 They made a Google map of all the cupcake bakeries in greater Los Angeles. Go on a hunt for your favorite. Here's a screenshot of the map. So cool! We'll make up our own list of the top cupcake bakeries and we won't leave L.A. by the wayside. Are you with me!?!?!?!? The cupcakes look delicious! From your link to the MSN city guide to the 10 best cupcake bakeries, I discovered a place for me to try cupcakes near our home - Love at First Bite in Berkeley. I am so excited! Thanks for the information!